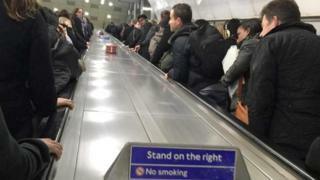 Commuters are being asked to stand rather than walk on the left side of escalators at a central London Tube station to see if it can cut queues. The three-week trial on the 23.4m long 'up' escalator at Holborn station is taking place during peak hours. Transport for London said the move will "increase the capacity" and prevent "queuing at the bottom" as people stand on both sides of the escalator. More than 56 million passengers use the station every year. Usually passengers stand to the right, leaving the left side free for people to walk up or down the escalators. Holborn Tube station, one of the busiest on the network, is set to get a new entrance and an enlarged ticket hall in order to increase its capacity by 80% by 2022. Peter McNaught, operations director for the Central line, said: "In the meantime, as part of a three-week trial to reduce queues and keep people moving through the station, we are encouraging customers to stand on both sides of the 'up' escalators during busy periods. "We believe this will increase the capacity of the escalators as more people will be able to board, preventing queuing at the bottom of the escalator."